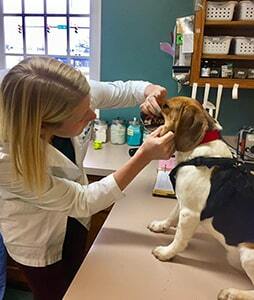 Did you know that we offer FREE pet dental exams for all of our current patients? We know you want your pet to be healthy and comfortable, but you may not realize that your pet has a dental problem. That’s where we can help! Sometimes it’s easy to tell if your pet needs a dental exam. Bad breath, swelling gums, changes in appetite and excessive licking can all be signs of dental issues. Other problems like abcesses and broken teeth may be less obvious The sooner we find a problem, the easier it is to treat it and stop further damage to teeth and gums. And if your pet’s mouth seems fine, a free dental exam can be the beginning of an effective prevention plan. By learning about great products and techniques to target dental health, you can prevent painful and costly problems from developing. If you’re not sure what’s going on in your dog or cat’s mouth, think there might be a problem, or need tips for at-home pet dental care, make an appointment and take advantage of this great opportunity to address multiple pet dental questions. We will also check your pet’s teeth at each yearly checkup as part of our general wellness check.